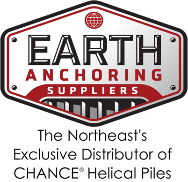 Due to environmental restrictions calling for no concrete, helical piles were chosen to anchor (11) grillages used in the construction of transmission towers on Boston’s north shore. With mostly organic soils the helical piles were the perfect deep foundation solution. SS200 RCS leads that transitioned to RS3500 round shaft piles went from 60 to 90 feet deep into the organic-heavy soils in a marsh along a municipal bike path. Foundations were installed for (8) tangent towers and (3) dead-end tower sites. Grillages consisted of (3) piles for dead-ends and (8) piles for tangent. It took just over two weeks to complete the work. “The project was a great success for all involved,” added Bramblett. EAS provided both the CHANCE helical piles and CHANCE custom grillages.